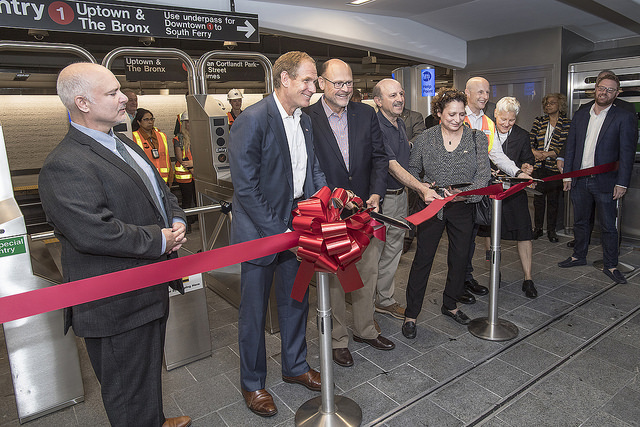 The Metropolitan Transportation Authority (MTA) opened the new WTC Cortlandt subway station on Saturday, September 8, 2018, restoring a subway stop to a resurgent area of Lower Manhattan that has once again become a major transit and commercial hub following the 9/11 terrorist attacks. NEW YORK — The Metropolitan Transportation Authority (MTA) today opened the new WTC Cortlandt subway station, restoring a subway stop to a resurgent area of Lower Manhattan that has once again become a major transit and commercial hub following the 9/11 terrorist attacks. Service in both directions began at noon. “The successful construction of the WTC Cortlandt station in the city’s most challenging building site represents our ability to deliver on our promises to modernize and rejuvenate the subway system,” said NYC Transit President Andy Byford. The new station has been constructed with fewer columns, providing direct views into the World Trade Center Transportation Hub for more intuitive wayfinding and customer flow, particularly for mobility-impaired customers using wheelchairs or motorized scooters. The new station is fully accessible, with one elevator for access from the street to the southbound platform, and an elevator from the mezzanine to each platform. The station provides a critical accessible transfer point given its location adjacent to the fully accessible World Trade Center Transportation Hub, which offers connections to 11 subway lines via the Cortland St , World Trade Center and the Fulton Center subway stations, and to Port Authority Trans-Hudson (PATH) service. The station includes modern amenities and security features such as Help Point kiosks on each platform and the two station mezzanines, which allow customers to get information or call for help in an emergency. The station is also air-tempered to maintain a comfortable environment, and includes two new fan plants that provide air circulation and emergency ventilation. The new station’s name references its location at the center of the World Trade Center and Cortlandt Street, which existed above the station location when the line originally opened in July 1918 but was demolished during the construction of the World Trade Center n the late 1960s. Since the 9/11 attacks, Lower Manhattan has undergone major construction to restore the area as a business district, tourist destination and transportation hub. Thanks to significant infrastructure investments such as the World Trade Center Transportation Hub, the Fulton Center subway station complex and nearby office towers and shopping complexes, the entire area has undergone a transformation that is now attracting new business and residential development. The National September 11 Memorial Museum and its memorial park, which are located steps from the station, provide a place of reflection that is visited daily by thousands of tourists around the world. Most of the new WTC Cortlandt station was built within the footprint of the Cortlandt St subway station, which was destroyed in the 9/11 attacks. The station shell, tracks and tunnels sustained devastating damage when the towers fell, cutting service from its southern terminus at South Ferry until a year after the attacks. The construction of the new WTC Cortlandt station began in 2015 when the MTA was given control of the site, which is located within the greater World Trade Center site overseen by the Port Authority of New York and New Jersey (PANYNJ). The station box, within which the station shell and structure are housed, had to be underpinned or supported by piles driven into the bedrock more than 60 feet below, creating an underground railway elevated above the bedrock. The station site was then built to grade, allowing the construction of a subway station 700 feet long and 47 feet wide to take place several floors below street level. A partnership of several agencies, including the MTA and PANYNJ, worked on the design of the new station. The infrastructure of the former Cortlandt St subway station was completely destroyed in the 9/11 terrorist attacks when the World Trade Center collapsed above the station. The MTA rebuilt 1,200 feet of tunnel and tracks and made significant repairs to the station shell, track tunnels and track infrastructure, which enabled the restoration of line service to the South Ferry terminal. The remainder of the Cortlandt St station was demolished as part of the overall reconstruction of the World Trade Center site, leaving behind the foundation for a new subway station to be built in its footprint. A white, monochromatic marble mosaic by the renowned multimedia artist Ann Hamilton was integrated into the station’s architectural design and aesthetically linked to the adjacent World Trade Center Transportation Hub. Commissioned by MTA Arts & Design, “CHORUS” spans a total of 4,350 square feet across the walls of both platforms and comprises small marble tesserae forming a white-on-white surface for text from the 1776 Declaration of Independence and the 1948 United Nations Universal Declaration of Human Rights. The tactile surface invites subway riders to touch the text as they read, creating meaningful personal encounters meant to acknowledge the civic ideals and aspirations of humanity and society.